Some Gram cards, like the german 128K GramKarte or the HSGPL card, have the ability to emulate the console GROMs. Because the data bus drivers for the side connector are stronger than real GROMs, the card will allways override console or cartridge GROMs. However, there is a risk that this will end up damaging the GROMs (although it never happened to me). However, removing the GROMs has several drawbacks:. The console becomes unbootable without a PE-box with a HSGPL card in it. If anything gets corrupted in the card EEPROM memory, the console may not boot. To overcome these problems, I suggest a very simple solution: install a switch that will disable console and cartrige GROMs so you can use your HSGPL card instead. By just toggling the switch you can go back to the original GROMs. The chip that generate the GROM selection signal is a 74LS03 open-collector NAND gate. Its active-high output is then inverted by a 74LS04 to provide the active-low GS* selection signal. It also gates the GREADY line and prevents it from stalling the CPU when the GROMs are not addressed (GROMs set GREADY as "not ready" by default). Since the 74LS03 has open-collector outputs, it needs a pull-up resistor to +5V. We are going to install an SPDT (single-pole dual-terminal) switch to toggle this resistor between pull-up and pull-down. In the latter position, GROMs cannot be selected any more! Open your TI-44/4A console, refer to my console surgery page for detailed intructions. Cut the end of the resistor that's away from the board edge, close to the notch near the side port. 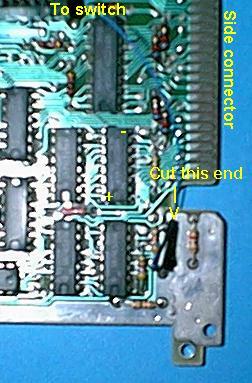 Leave the stump of the resistor in the board, as it must bring current from one side of the board to the other. Solder a length of wire to the free end of the resistor. Carefully isolate the connection with electrical tape, so it won't make contact with anything on the board. Here is a picture. The other end of the wire should go the the middle connection of the switch (the pole). Connect one switch terminal to +5V, the other to ground. You will find +5V at the upper right pin of any 74LSxxx chip, and ground almost everywhere, for instance at the bottom left pin of any 74LSxxx chip ("up" is where the notch is on a 74LS chip). When the switch is on the left, GROMs are disabled. When it's on the right, GROMs work as usual. Drill a hole in the plastic casing of the console and mount the switch in it (see picture). The easiest way to ensure that the switch works is with my RIP debugger. You can try other debuggers, but many won't work because they call the keyboard scanning routine in the console ROMs and this routine gets the ascii codes from the console GROMs. RIP does its own keyboard scanning and is thus independent of the console GROMs and ROMs. It can be downloaded from here. From Editor/Assembler, use option 3 to load RIP/O, then run program "RIP". Press Fctn-8 three times to select G-memory. Enter address 0 and press enter. 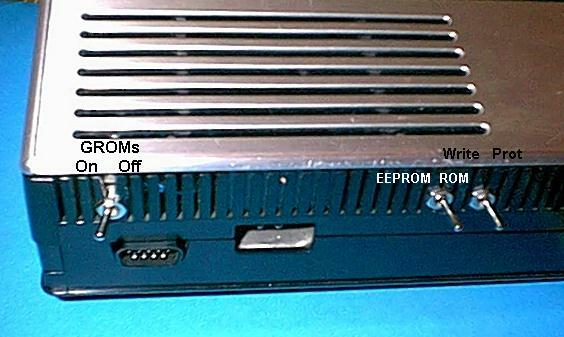 You should see the contents of the first console GROM: >AA 02 00 00 etc. Now toggle the switch and press Fctn-4 and Fctn-6 to move up and down memory. You should only see zeros now. Toggle the switch back, press Fctn-4 or Fctn-6 and watch the GROM reappear. Press Fctn-8 and enter address 6000, the address of the cartridge that you have plugged in. Toggle the switch and verify that the cartridge GROMs are equally disabled (NB cartridge ROMs are not!). Toggle the switch back to the position where the console GROMs are enabled. Press and hold Fctn= for a short while to exit RIP. Revision 2. 4/29/02 OK to release.